Providing an enriched environment can increase activity, decrease mental dullness, and prevent many behavior problems. Cats need mental and physical stimulation. An enriched environment gives cats the opportunity to create their own positive experiences. Vertical space is highly desirable for cats and increases the overall space available to the cat. 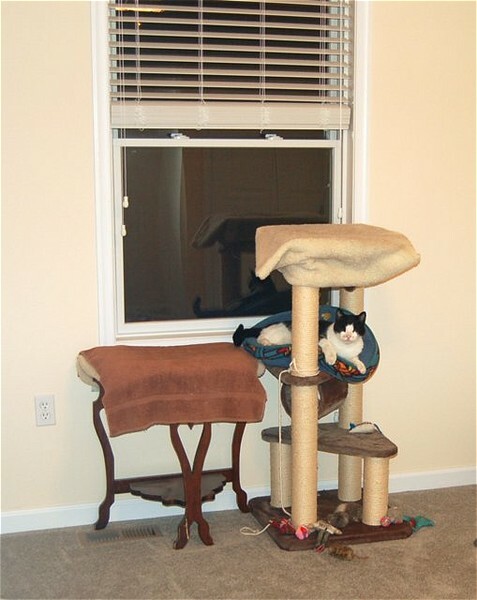 Provide cat trees with hiding spots, perches and shelves in multiple, preferably sunny locations. Scratching is normal cat behavior, so you need to provide acceptable scratching materials (scratching posts) in various textures (carpet, sisal, wood), and at the appropriate height. Posts need to be tall enough for your cat to stand on his back legs and stretch to his full length to scratch. Locate the post in a desirable area such as next to a window or sleeping area.To train your cat to use the post, reward him with treats and praise. You can put catnip and his favorite toys on and around the post. For cats which prefer horizontal scratching, ensure that you have an appropriate apparatus. We carry a nice tall vertical scratching post plus a horizontal scratcher to help keep them using their posts. Interactive toys and hunting games allow cats to stalk and catch. There are an assortment of wands with toys on them that you can use to engage your cat's interest. Sometimes a simple rope with a knot on the end will provide the best entertainment. Use of laser toys is also entertaining to both the cat and yourself. Keep the selection of toys fresh. You don't need to buy new toys, just put toys away and introduce them back later. Outdoor enclosures such as those made by Purrfect Fence (www.PurrfectFence.com) and sunrooms are fantastic for wildlife viewing and mental stimulation. You can also find bird feeders which can be placed in the window which allow the cat to see the bird, but the bird cannot see the cat. Placement of bird feeders adjacent to windows in the house is also effective. Since cats in the wild may eat 10-20 small meals per day, try to reproduce this behavior with your indoor cats. Hide food in multiple locations around the house, use interactive food puzzles or toys, and feed small amounts frequently. Socially, cats need companionship in the form of petting and grooming, and play. Having more than one cat is desirable for most cats, BUT having an excess number of cats (generally more than 6) is too much for most cats to handle. If you have multiple cats, you need to have several stations with food and litter boxes available in multiple locations throughout the house. This way a cat can avoid another cat if desired. Remember to have 1 more litter box than the total number of cats in the house and clean them at least once daily. Cats can be trained, and many enjoy the assocated attention. Reward the cat with treats or positive attention to encourage desired behavior. Redirect undesired behavior, but never swat or slap the cat. You can use a squirt bottle or loud noise (coins in a can) to stop cats that are scratching inappropriately or on undesired items (tables, countertops). With time and persistence most cats can be trained to sit, come, and allow tooth brushing, nail trimming and grooming. The more time and effort you put into your cat, the happier and healthier he will be.